GRAVITY (for “Gene inteRaction Analysis of Variants in Individuals: a Tool for You”) is a new open-source Cytoscape app that allows an efficient visualisation and analysis of all the exonic variants by mapping them on a protein-protein interaction (PPI). 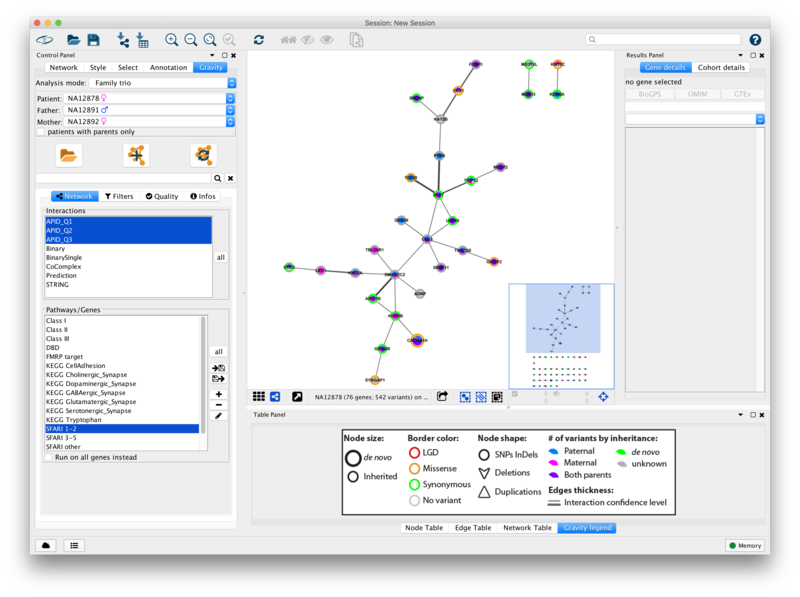 Cytoscape with GRAVITY network displayed. Visualise sequencing data from cohorts using a standard VCF file or a GEMINI database. Uses the pedigree informations to enrich the representations and analysis available. Integrate interactions between the genes using different PPI networks. Trio: to focus on the mutations of a single individual while integrating, when available, the knowledge of his/her parents. Comparison of 2 samples: to focus on similarities/differences between 2 samples. This is particularly interesting for somatic variants that can be observed across tissues, conditions, time, etc. A Cohort panel to quickly find other individuals in your cohort are sharing variants in the currently selected genes. We are still developing this app and are planing to add some new functionalities based on needs and requests. Other types of interactions networks such as coexpression or regulation. We would like to thank Yang-Min Kim for the design of the logo. Logo font Faune, Alice Savoie / Cnap.